To Sydfold on the "Ships starting with S" page. Uboat.net also has a picture (external link). Delivered in Apr.-1918 from Machf. & Sheebswerf v P. Smit jr., Rotterdam as Sydfold to Martin Clausen, Haugesund. 2434 gt, 1430 net, 3950 tdwt, 287.1' x 45.2' x 20.6', Triple exp. (by yard). Transferred to D/S A/S Fold in May-1920, management of this company and the ship transferred to John K. Haaland, Haugesund in Febr.-1929, Trygve Eriksen (John K. Haaland & Co.) from 1934. A Forum message from someone whose great grandfather served on Sydfold at some point (Bjarne Martin Høgenæs). He also served on Heimgar. Captain: Gunnar Egge (later joined Anna Sofie). 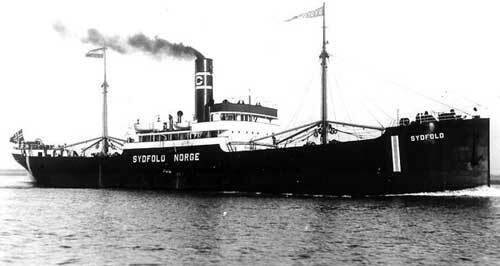 Torpedoed on Jan. 22-1940 by U-61 (Oesten) and sunk 58 40N 00 30W when on a voyage from Kristiansand to Newcastle in ballast. 5 died, 19 survived. The Norwegian website that I've linked to below (Stavern Memorial) states that the survivors were picked up by the Haugesund ship Rona, which reported to have seen the lights from a U-boat. Date is given as Jan. 21 here, and the site adds that a fire erupted in the after part of the ship where 4 men were presumed killed immediately. Stoker Arthur Nikolai Andersen, Stoker Rudolf Hovland Gihl, Ordinary Seaman Arne Martinsen, Stoker Ole Stenberg, and Stoker Hans Tveitastøl. For info, U-61 was also responsible for the attack on Sangstad the following month. Back to Sydfold on the "Ships starting with S" page. The text on this page was compiled with the help of: "Nortraships flåte", J. R. Hegland, "Våre gamle skip", Leif M. Bjørkelund & E. H. Kongshavn, and misc. (ref. My sources).